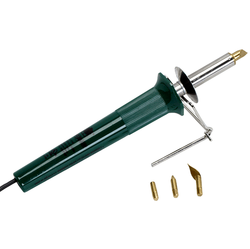 The soldering iron type has its limitations, in most cases, they do not have any way to control the heat. They usually plug directly into a power outlet. Some kits have interchangeable tips, that require you to switch the power off and wait until the tip cools, before you can change it. These tools are relatively cheap to buy, but are seriously limited to the quality of art you can achieve using them. The wire burner type are very popular. They have a nib made of shaped Nichrome wire, which can be exchanged as needed. The pen is attached to a heat adjustable transformer, allowing for very light to deep burning at the turn of a dial on the transformer. These units are not cheap, but they will generally provide many years of trouble free use. The interchangeable nib burner is the newest kid on the block and one that is fast becoming the burner of choice. The burning nibs plug into the pen handle and are interchangeable. Note: On some particular brand units, the nib are held in place by a retaining screw. The nibs are usually bought separately, as there are many different shapes available. This allows you to purchase the type of tips you require for your style of artwork. Some units can have two burning pens attached, that allows you to switch from one tip to another, simply by swapping pens. So, which ever type tool you choose is up to you. There are many makes to choose from and again, that choice is up to you. Just remember.... Anything of quality, was never created using cheap equipment.